The Khadga or Sword in Hinduism is a broad, parallel-sided sword, having two sharp edges and a pointed end. It must be noted that the shape of sword has undergone numerous changes. Today, artists create swords depending on their imagination. As per Puranas, Brahma first created sword to free earth from asuras or demons. Brahma gave it to Shiva and he gave it to Vishnu. It was then passed on to sages. Finally, Sage Vrishabha handed it over to Indra to fight the demons. The sword was fifty thumbs long and four thumbs wide and was always carried on the left side. 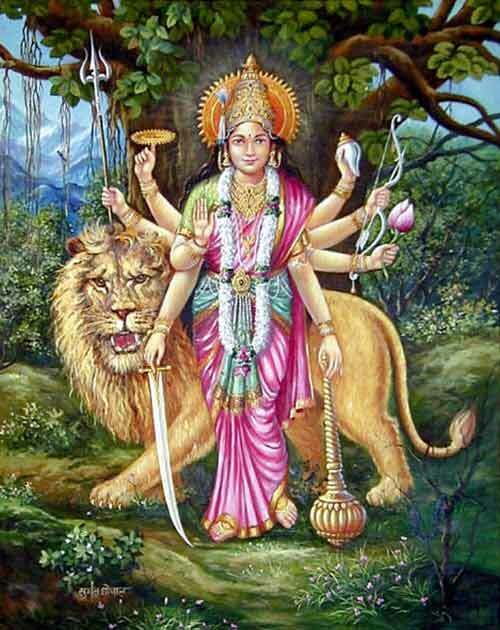 The sword is widely associated with Goddess Durga and with the fierce forms of Shiva. It is also believed that the sword is a symbol of enlightenment and it destroys ignorance.